Mr Kushner is the brother of senior Donald Trump adviser Jared Kushner. 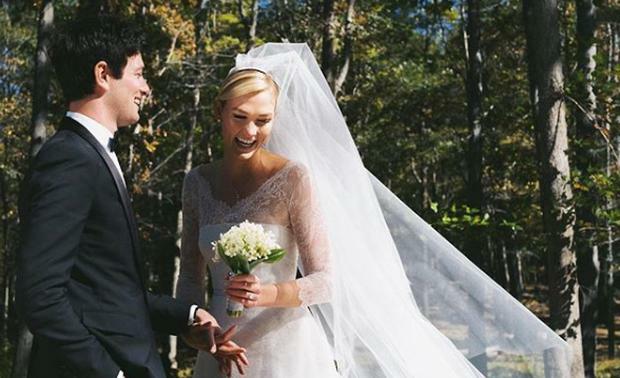 Karlie Kloss has married Joshua Kushner. The 26-year-old model took to Instagram and Twitter to confirm the pair have wed by sharing a picture from their big day, which features her in a white lace Dior wedding dress while holding a bouquet, and the 33-year-old businessman looking dapper in a black suit. She simply captioned the snap: "10.18.2018" The couple held a Jewish ceremony in New York with less than 80 people in attendance, and they are expected to have a larger event for friends and family next year. A friend who attended told PEOPLE: "The wedding was intimate and moving. The couple were beaming with happiness." The former Victoria's Secret Angel and the entrepreneur - who met at a dinner party in 2012 - announced their engagement in July, weeks after Joshua had popped the question in the Big Apple. A source said at the time: "They're both overjoyed and happily celebrating. Their hearts are full and they're excited to build their future together." Karlie recently admitted she took inspiration from the Duchess of Sussex, who wed Prince Harry earlier this year, when picking out her wedding gown. She said: "She looked gorgeous on her wedding day. I feel it's a day what you want to just feel happy, beautiful, and not stressed. I think what makes someone most beautiful, especially on their wedding day, is when that glow comes from the inside. "I'm still kind of enjoying the engagement bliss, but I'm definitely somebody who opts for 'less is more' when it comes to beauty. I love a strong lip or a strong eye, but I would want to keep it more natural. For hair, an updo is pretty logical. Get it out the way, so you can dance and have a good time."